I obtained a PhD degree in computer science from University of Rennes 1 in November 2009. I prepared my degree in the ASAP team, under the supervision of Achour Mostefaoui. 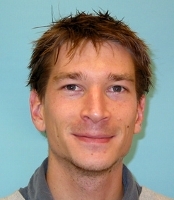 From January 2010 to September 2011, I worked as a postDoc in the FG Inet group , Berlin. Since November 2011 I work as a full time researcher in the TSF group . I'm broadly interested in graphs, as a mathematical object, and graphs, as a model of the interaction structure of real world objects. I'm particularly interested in algorithms that rely on/exploit/capture such graphs, and how to optimise them for "typical" "real world" interaction structures, where the meaning of "typical" and "real world" is defined by a product of fashion, context, and mathematical docility. For this I typically try a find a blend of abstract models and data mining approaches. The objective of my thesis, entitled "Structures and Distributed systems", is to study the impact of communications structures on various distributed systems. Its aim is to consider communication structures as a parameter of the system (and thus of the problem...). In this context my thesis enlights the impact of the communication structure on distributed algorithms exploiting it, and explores different directions to detect/adapt/counter this impact. POMACS (SIGMETRICS) Irvine, California, USA, June 2018. Journal Distributed Computing (DIST), Springer, 2014. Elsevier Information Processing Letters, 10.1016/j.ipl.2014.03.006, 2014. Computational Intelligence Journal (CI), 10.1111/coin.12022, 2014. Journal Distributed Computing 26(4): 209-222 (2013). Elsevier journal of Computer Communications, special issue on Complex Networks. 2010. 38th IEEE Conference on Computer Communications (INFOCOM), Paris, France, April 2019. 2016 ACM International Joint Conference on Pervasive and Ubiquitous Computing, Ubicomp 2016.
with Kermarrec A.M., Mostéfaoui A., Raynal M., and Carneiro Viana A.
with Fernàndez A., Jiménez E. and Raynal M.
with Mostefaoui A. and Hamouma M.
with Mostefaoui A. and Raynal M.